No Kong has been killed or hurt in the making of this review. Okay, I lied. Hundreds of Kongs have gone to their eternal resting place. But let me tell you this – their deaths were not in vain, because finishing Donkey Kong Tropical Freeze makes me one hell of a skilled gamer. Donkey Kong is a tough platformer – it’s absurdly hard sometimes. 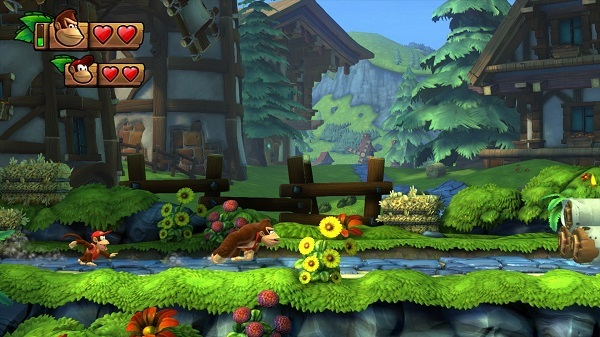 You could say that its level design and game mechanics are made especially to make you go ape. Some levels remove the ground underneath me, while others challenged my precision. 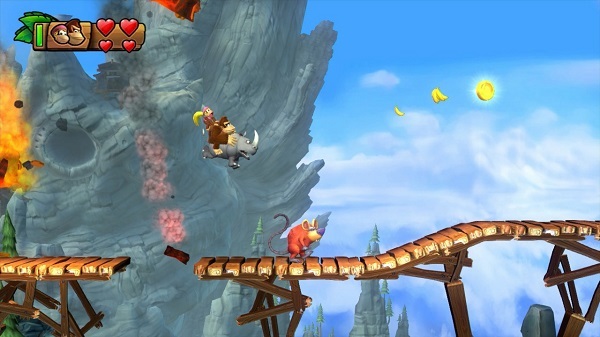 This ain’t a Donkey Kong Country rebirth – it’s something else entirely. It’s a special platformer that, with the Wii’s revival, made way for bridging our beloved classic series from the SNES to a more modern medium. Oh boy, here I go smashing again! It gives roughly 13 hours worth of mindless chaotic fun, with plush jungles and bizarre islands to explore. DK and company have never looked better. Their pelts look lush, and characters have a ton of tiny details – such as DK’s ageing facial lines or how Cranky Kong’s teeth line up. The little Kongs have distinct abilities, which you can use to either keep big daddy Kong alive or grant you some well deserved motivation to discover well-hidden secrets. But, out of everyone, I found myself itching to get my hands on Dixie Kong time and time again – she has an excellent helicopter spin and it helped me reach high-up platforms and correct my uhm, failed jumps more often than I care to admit. Cranky Kong’s cane bounce, which is underrated to say the least, was a most useful tool that came in handy quite often – travelling over spiked pits and landing safely on the other side was incredibly satisfying. I was grinning the whole time. Diddy Kong’s jet pack annoyed me every time I tried to use it, but this isn’t to say that she doesn’t have useful qualities. Diddy has floating abilities, and she can hover over small pits. However, the bottom line is that you have to pick your little Kongs carefully – it’ll mean the life or death of your walktrough. Whomever you choose to tag along, keep this in mind – don’t make favourites, as some Kongs are better when used in particular encounters than others. 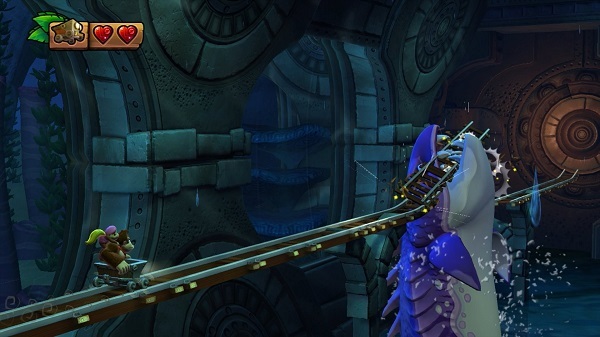 Regardless of how you wish to play Donkey Kong Tropical Freeze, you’ll find the world massive and exciting. Each stage offers a new and refreshing experience. Scaling is done just right and everything feels much bigger than your usual 2D games. I travelled across a turbulent desert where a tornado was breathing down my neck, and at the same time it was tossing enemies into the air. I danced on a giant hot air balloon in the alps, and I courageously fought off a colossal octopus. Donkey Kong Tropical Freeze and its ever switching levels made me enjoy the game even more and while I am writing this I have a urge to leave everything behind and just spend my night racing in a rollercoaster-like minecart across the world. 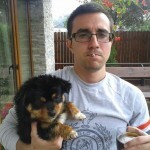 I’m not okay in the head, but who is? The arduous challenges blended pretty nicely with the awesome level design. It’s oh-so satisfying when you fail at a level countless times only to complete the stage in minutes just because you had enough. Manly tears were shed, and curses were put upon Nintendo and developers. Donkey Kong – the ape that can minecart into a mythical sea beast with a child in the backseat, and people still call him Dad of the year. Yet, for the life of me, I can’t think of a more entertaining platformer. It handles way differently than any other Mario title, so don’t jump into DK Tropical Freeze thinking you’re the crème de la crème – because you’ll end up a creamy splashed liquid at the bottom of a pit. 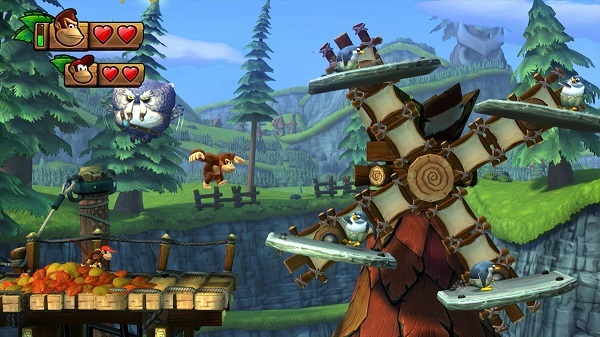 Donkey Kong Tropical Freeze has six islands that offer a plethora of challenges and unique stage design with secrets carefully concealed. Tons of fun embroidered deep inside tough levels and gorgeous scenery. A platformer that will test your mettle with incredibly hard challenges and annoying boss battles. Replayability has a spotlight because of the variety of collectibles, and searching for them doesn’t feel lacklustre and pointless. 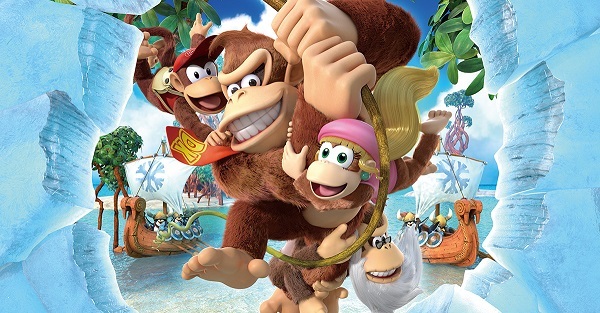 Donkey Kong Tropical Freeze offers a rewarding sense of achievement after overcoming gruesome obstacles. It’s a must buy, and you can acquire it from Amazon right now! It costs $41.88 at the moment of writing this review. Check our game deals and promo page for more awesome deals on video games. The look of terror on that rhinoceros haunts my dreams. To unlock Hard Mode, you need to first clear the game once on any difficulty. Can you come out as the top banana of the jungle with just one heart and literally zero partners backing you up? Search and collect Red Balloons. They will give an extra life each time you find them. 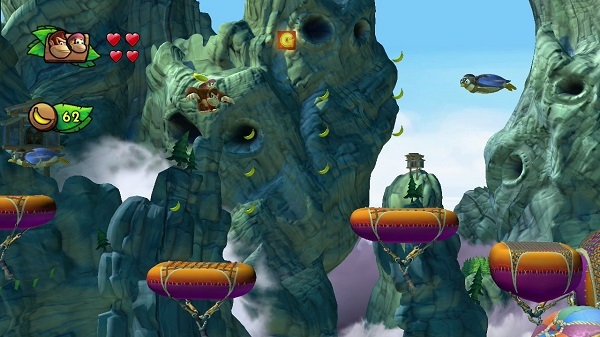 Also, if you collect 100 bananas in a level, it will fill your Kong POW meter. If you activate it, every enemy on your screen will transform into a helping item. Different partners give distinct items, so it’s best to experiment with them and find your favourite. Take Diddy Kong along with you and activate Kong POW in order to turn all of your enemies into Red Baloons. If you use Cranky’s distinct ability with Banana Juice from your inventory, you’ll become an unstoppable force. Cranky Kong can use his cane to jump over spiked pits, by giving him the ability of Banana Juice you make him a behemoth. This works only if you time it just right. When you go into a boss fight you carry with you an extra barrel. Right after the intro scene, roll towards the barrel and break it before the one in your inventory is used. This will bring to the screen four Kong characters. It doesn’t work every time, and you’ll have to restart the stage quite often, but it’s worth a shot if you’re having troubles with a particular Boss.